Scleral contact lenses are an excellent choice for patients that suffer from vision problems, but have irregularly shaped corneas. Traditional lenses have difficulty staying in place if the surface of the eye is abnormal. 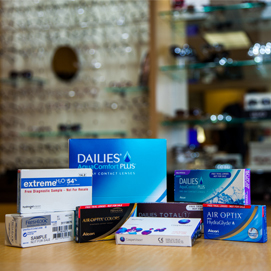 For a unique, secure fitting, scleral contact lenses are your best bet. Scleral lenses are generally for patients who have visual disability from corneal irregularity. They can be used to treat Keratoconus, trauma, or corneal transplant complications. Scleral lenses can also be used to manage patients with compromised corneas. This could be due to Stevens-Johnson syndrome, Sjogren’s syndrome, Graft Versus Host Disease, and neurotrophic keratitis. The initial visit consists of a medical eye exam, computerized corneal maps, photography, and scleral fitting. After measurement for the lens parameters, the lab can start production of the contact lens immediately. If you are traveling, delivery of your scleral lenses can be made within 3-10 business days. How are scleral lenses custom designed for my eye? Dr. Leonard uses a modern scleral lens design and fitting technique that streamlines the fitting process. Lenses are custom designed from measurements using diagnostic lenses. This process is a very efficient way to produce custom scleral lenses. He uses modern, efficient fitting methods to help minimize additional costs. Will my insurance cover scleral contact lenses? Every insurance company is different. We have relationships with all of the major insurance companies. If you are being fit with scleral lenses out of medical necessity, we will inquire if your insurance policy covers specialty contact lens fitting and materials. We do offer financing options through CareCredit. We understand that vision is important. So, we do our best to find an economical solution. How can I schedule an appointment with Dr. Leonard for a scleral contact lens fitting? Please call our office at 818-891-6711 for an appointment. You may also email us at staff@drbleonard.com. And, of course, our online patient scheduling system is just a click away. You’ll find the button in the upper-left hand corner of every page on this site. Want to learn more about Scleral Contact Lenses? Click here to read our article on Scleral Contact Lenses. Scleral Contact Lenses have a variety of features designed to provide all-day comfort. AquaComfort and HydraGlyde technology allows scleral contact lense wearers in SFV to enjoy better, more comfortable vision. Dr. Leonard takes the time to provide patients with a thorough eye exam and consultation. Vision health can be complex, but Dr. Leonard's team helps to put the information you need into focus. 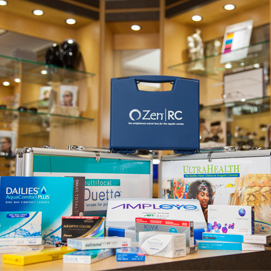 From AMPLEYE to Zen RC, Dr. Leonard's office is stocked with the latest advances in scleral contact technology. His office is a convenient, one-stop solution to SFV's vision needs.